Al eerder kondigde Sheikh Mohammad Bin Rashid Al Maktoum aan dat er energiezuiniger gebouwd zou gaan worden en nu is Sheikh Mohammed bin Zayed Al-Nahayan van Abu Dhabi, aan de beurt met de aankondiging op de World Future Energie Summit van Masdar City en een investering van 15 miljard in duurzame energie. Kijk dat schiet nou eens op. Zouden ze daar al door hebben dat het slim is om zelf alle benodigde energie duurzaam op te wekken en de vervuilende energie gewoon duur te verkopen aan westerse landen die maar niet opschieten met echt grote investeringen in duurzame energie. Waar blijft ons National Sustainability Fund? Masdar is a planned city in Abu Dhabi, in the United Arab Emirates. 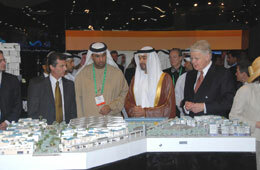 It is an initiative by the Government of Abu Dhabi through Mubadala Development Company. Designed by the British architectural firm Foster + Partners, the city will rely entirely on solar energy and other renewable energy sources, with a sustainable, zero-carbon, zero-waste ecology. The city is being constructed 17 kilometres (11 mi) east-south-east of the city of Abu Dhabi, beside Abu Dhabi International Airport. The project is headed by the Abu Dhabi Future Energy Company (ADFEC). Initiated in 2006, the project is projected to cost US$22 billion and take some eight years to build, with the first phase scheduled to be complete and habitable in 2009. The city will cover 6 square kilometres (2.3 sq mi) on a site 6.4 km2 (2.5 sq mi) in size and will be home to 50,000 people and 1,500 businesses, primarily commercial and manufacturing facilities specialising in environmentally-friendly products, and an expected 40,000 workers will commute to the city daily. It will also be the location of a university, the Masdar Institute of Science and Technology (MIST), which will be assisted by the Massachusetts Institute of Technology (MIT). Automobiles will be banned within the city; travel will be accomplished via public mass transit and personal rapid transit systems, with existing road and railways connecting to other locations outside the city. The city will be walled, to keep out the hot desert wind. The lack of cars will allow for narrow, shaded streets that will also funnel breezes from one side of the city to the other.Masdar City will be the latest of a small number of highly planned, specialized, research and technology-intensive municipalities that incorporate a living environment, similar to Novosibirsk, Russia or Tsukuba Science City, Japan. Notable partners in the project through its Clean Tech Fund include General Electric, BP, Royal Dutch Shell, Mitsubishi, Rolls-Royce, Total S.A., Mitsui and Fiat. Construction of the first phase of the project is being managed by CH2M HILL and design of the central Masdar headquarters building has been awarded to Adrian Smith + Gordon Gill Architecture. An ariel fly through of Masdar City, the world’s first zero-carbon, zero-waste city, currently under development in Abu Dhabi by program manager CH2M HILL. Video rendering by Foster & Partners. Planning a Sustainable City in the Desert. Back in 2007, when the government here announced its plan for “the world’s first zero-carbon city” on the outskirts of Abu Dhabi, many Westerners dismissed it as a gimmick — a faddish follow-up to neighboring Dubai’s half-mile-high tower in the desert and archipelago of man-made islands in the shape of palm trees. The electric vehicle will serve a six-stop route between Marina Mall, Abu Dhabi Central Bus Station and Masdar City, Abu Dhabi’s flagship sustainable urban community. The Eco-Bus will be integrated into the DoT’s existing fleet, while the service will be free until the end of March 2019.